Simple and clean above counter round white ceramic vessel. Completely finished from all sides including back. Premium white glaze for a glossy finish. High-quality ceramic cartridge. Kiln dried ceramic construction. Smooth non-porous surface prevents from discoloration and fading. Vessel features an overflow. This model is designed with integrated hot-cold supply lines for standard US plumbing connections. All mounting hardware and hot-cold waterlines are included. Can be used with a deck mount faucet installation. Double fired and glazed for durability and stain resistance. Sleek single lever handle for ease of operation and temperature control. Constructed with lead-free brass ensuring durability. Simple and clean above counter fluted round white ceramic vessel. Designed for easy installation. Installation instructions included in the box. Only faucet is CUPC approved. 1.75-in. standard US drain opening. Recommended drain for this sink is 871211017954.. Luxury bulky solid brass look and feel. Quality control approved in Canada and re-inspected prior to shipping your order. The square-shaped bathroom sink is crafted from vitreous china that is baked at high temperatures so the surface is stain-resistant, germ-resistant and easy to clean. The wide outer shape complements the curved inlet design giving a subtle, transitional look compliant to any theme in your bathroom. All side enamel finish. 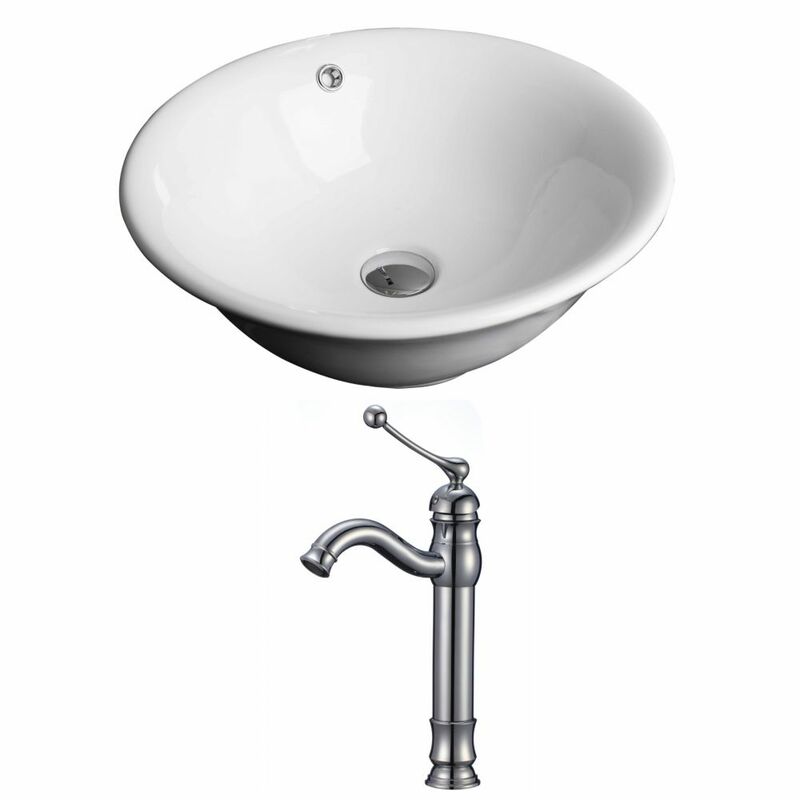 18-inch W x 18-inch D Round Vessel Sink in White with Deck-Mount Faucet It features a round shape. This vessel set is designed to be installed as a above counter vessel set. It is constructed with ceramic. This vessel set comes with a enamel glaze finish in White color. It is designed for a deck mount faucet.